The Lodge at Chaa Creek is once again celebrating February as Belize’s “Month of Love,” and this year St Valentine’s Day will kick off some early springtime “Love Blooms in Belize” offers that encourage couples to reconnect with nature and each other in a beautiful rainforest setting, the popular Belizean jungle lodge’s “romantic adventures” coordinator announced. Denise Duran said the eco-resort’s month-long celebration of love continues to grow in popularity, and has taken on a new dimension this year as couples treat themselves to an escape from an unusually harsh northern winter. “We’re finding that our ‘Winter Rescue’ initiative is attracting more couples who wish to take advantage of our warm winter wonderland offers and the more competitive service and fares airlines are offering this year. “For example, our Winter Warmer discounts of 20% off accommodation on selected dates make a tropical romantic getaway more attractive than ever,” Ms Duran said. From the 18th of January 2018 to the end of the month, and for select dates in February 2018, The Lodge at Chaa Creek is offering 20% off accommodation, with complimentary upgrades when available, and no charge for guests 18 and under who stay in their parents’ room, suite or villa, she explained. “We wanted to make it affordable and practical for people to get away from the freezing conditions up north and have a tropical vacation break,” Ms Duran said. “Also, imagine giving someone special a card on Valentine’s Day that says, ‘Guess what? We’re going to Belize this month!’ If that doesn’t bring some sunshine and warm to a cold grey day, nothing will,” she added. Ms Duran said “Love Blooms in Belize” will continue to evolve in the coming months, with a special emphasis on love and romance from April to June. “They say March comes in like a lion and goes out like a lamb, but in Belize it’s a pleasantly steady month for weather. It’s the middle of our dry season, so days and nights are generally clear and rain-free, with average temperatures of 83°F (28°C) and 74°F (23°C). “And then spring really arrives, with brief cooling showers beginning in April. May is also lovely, with temperatures rising to an average of 82°F (28°C) with morning rains and the occasional thunderstorm at night cooling things off. Being surrounded by a vast oxygen-producing rainforest also keeps things pleasant at Chaa Creek, and by June that’s complimented by fresh easterly breezes coming in from the Caribbean along with short afternoon showers. “It all adds up to lovely springtime weather that fosters flowers, birds, butterflies, and romance. 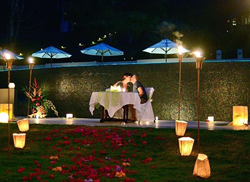 Walking through our manicured tropical gardens, or along jungle trails, surrounds you with so many flowers you won’t need a bouquet; even though couples may find them in their rooms,” she said. Ms Duran encouraged people to visit Chaa Creek’s website or Belize Travel Blog to learn more about “Love Blooms in Belize” and to keep up-to-date with new offers. People may also contact the lodge directly, she said. “Just let us know that you’re a couple looking for a romantic holiday, and we’ll look after you. “I’m fortunate to have a team of dedicated ‘romantic adventure’ specialists who are more than happy to work with couples to plan the perfectly tailored springtime vacation. With horseback riding, canoeing, an infinity pool, the world renowned Hilltop Spa, exquisite farm-to-table dining, and so much more on offer within our 400-acre private nature reserve, we can help craft the perfect romantic getaway, as well as the ultimate destinations weddings, honeymoons, and second honeymoons,” she said. “Love is a many splendored thing that seems to thrive in warm weather and nature’s beauty. Add in eco-luxe accommodation, exquisite amenities, sumptuous dining and a wealth of activities with plenty of time to relax, and watch it grow. “And see how even just the anticipation of a tropical vacation warms up the chilliest winter day,” Ms Duran said.